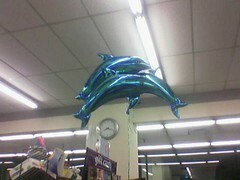 Dolphin balloons at Safeway. They also have bird, bumblebee, and dragon balloons. Not sure what holiday these are for. Lent? Maybe the dolphins signify tuna?